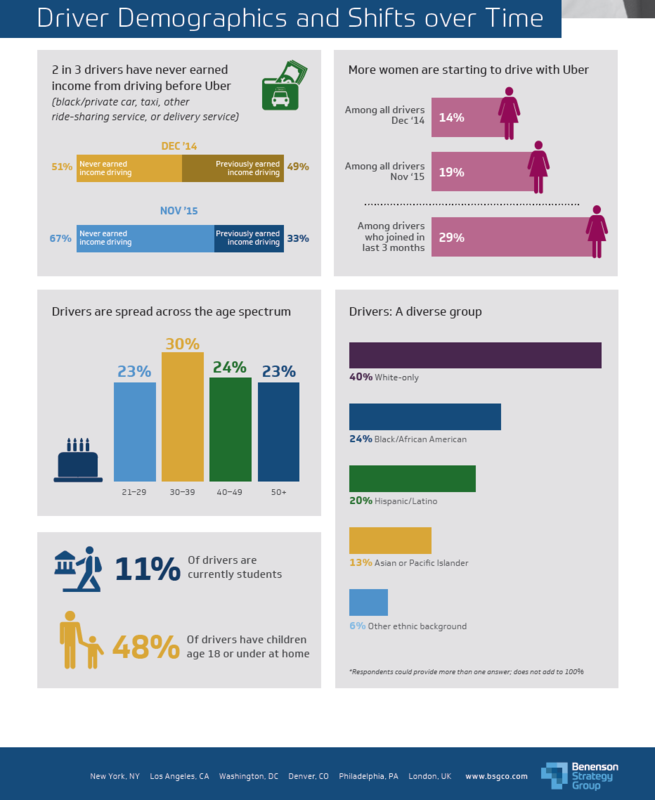 One year ago, Benenson Strategy Group surveyed our driver-partners in the U.S. to learn more about how and why drivers use Uber, and found that drivers chose Uber by and large to have more control over their time and their income. Since then, the number of active Uber driver-partners in the U.S. has more than doubled, from 160,000 to over 400,000, and our partners have been paid over $3.5 billion in the U.S. so far this year. A new survey released today shows that the trends we saw last year have intensified. More people are using the platform on the side, higher numbers of women are starting to drive, and driver-partners are using the app as passengers as well. More women are starting to drive with Uber than ever before: 29% of drivers who started in the past 3 months are women. Overall, 19% of all drivers in the U.S. are women, up from 14% last December. Many students are using the platform: 11% of drivers are students, nearly double the percentage of students in the U.S. population overall. Lots of parents: Nearly half – 48% – of drivers have children age 18 or under at home. More everyday people are using the app: Two-thirds of drivers, or 67%, never earned income from driving before partnering with Uber (up from about half of drivers – or 51% – last December). More people are using Uber on the side: 69% of drivers have other full-time or part-time work outside of Uber, up from 62% last December. Most drivers don’t schedule themselves, they drive when they have time: 50% drive fewer than 10 hours per week on average; 40% say when they drive just depends what else is on their schedule, 38% set an earnings goal, 16% drive a set amount of time. Flexibility is a big motivating factor: 88% started driving with Uber because it fit their life well, not because it was their only option. People are using the app both as drivers and passengers: More than 1 in 4 drivers takes Uber (as a passenger) at least once a month. Increasingly, people do not talk about “becoming an Uber driver-partner.” It’s a much simpler decision – do I want to make money using my car? 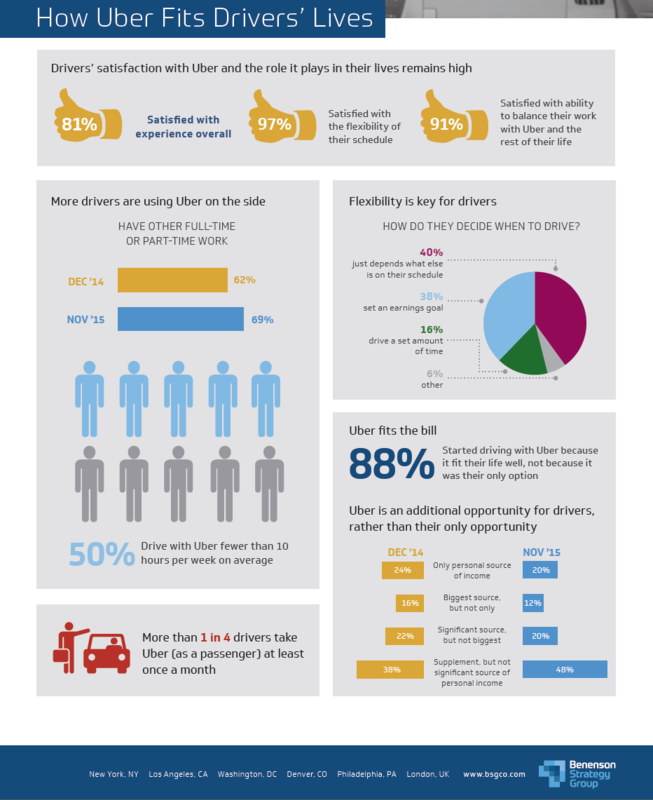 These findings mirror what we hear every day from drivers: flexibility and the chance to be their own boss is a key reason they use Uber; they want work that fits around their life, not the other way around. And most of our partners work with Uber to make money on the side, driving on their own time and toward their own unique goals.